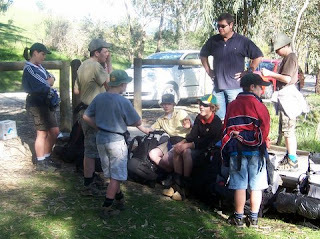 Leanne's Little Place: District Scout Hike....off they GO!!!! 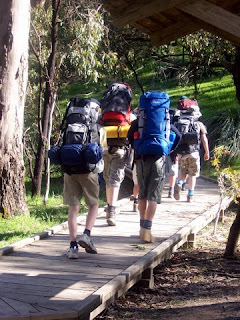 Rod and I have just got home from dropping Aaron and Renee off, for their District Hike for Scouts......I am still getting over Mother Anxiety..LOL. Stupid really the kids have been involved in Scouting for quite some time, you would think that I'd be used to it by now. 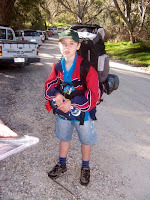 Having said that though it's not Renee I am worried about, more so Aaron, this is his first big hike like this, he has only just started Scouts, having come up from Cubs, so it is a huge challenge for him. They started at 9.20am this morning. Renee is Patrol Leader, which brings me to another point, both Renee and Aaron are in the same patrol for this excercise....hmm could be interesting given they normally can't spend more than 10 minutes in the same room together, before the name calling or the dirty looks start!!! I am hoping that there are still 7 scouts on board when they get to their destination tonight and hoping that one of them hasn't been misplaced in the forest somewhere! Aaron was so excited, I think more excited about his trail mix LOL, with MM's, Jelly Beans and Nutri Grain, what more can a boy want!!! He will be tired tonight though. They are walking 11kms today and 11kms tomorrow, carrying their packs with their own supplies - sleeping bag, tent, mat, clothing, first aid, food, cooking stove and water!!! The kids packs weigh around 9kilos, which is pretty darn heavy, especially when you have been lugging it around all day. When they get to final destination tonight, they have to pitch their one man tents and cook their own dinner, that's a big ask for any kid!!!! 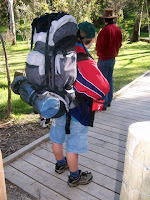 above - Just arrived at check in....Aaron ready with his pack..he wobbled when we put it on him, it's nearly as big as him!!! above - Saying goodbye to dad. Renee is the only girl in her patrol, think she could be over the boys by tonight! Second pic Renee in front followed by Aaron. above - Waiting for the patrol to be called up to Go!!! Renee on far left and Aaron second to the right. 7 Scouts in all. above - Off they Go.....Renee leads off....closely followed by her little brother...Good Luck kids!!! Update at 1.30pm.....our kids are doing great!!!!!!!!!!!!!! We are so proud of them, all of them!! Rod has just got off the phone from their Scout Leader who is as pleased as punch with them. Renee's patrol is currently 40 minutes ahead, having passed two other patrols......WAY TO GO KIDS!!! Aaron is going great guns and so far is still managing with his full pack, nothing as yet has been taken from him to lighten his load, I am so proud of him, even almost got a little teary for him. Yipee!!! Update at 5.00pm.....they are WINNERS on day 1. They finished at 2.30pm, having hiked for a total of 5 hours and 2 minutes. How cool is that. Renee sounds tired, but feeling fine, even after having hiked all day in new hiking boots. Aaron, is also tired but totally happy with himself. He finished carrying his full load. He said that his feet hurt a little and his pack was heavy. He was cooking his dinner when I spoke with him. Time for them to rest up now to do it all again tomorrow. Go get em kids!!!! Well actually this is one that I had started a few nights ago, takes me so long to finish anything, I procrastinate way too much. I think I'm happy with it LOL. 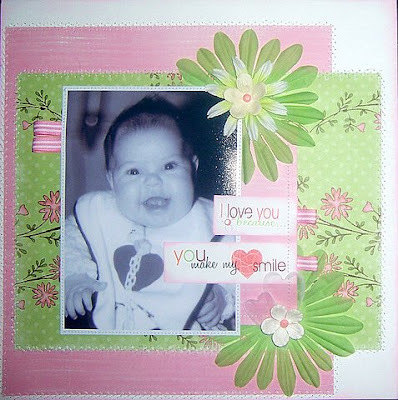 This is Renee when she was about 3 months old, I love this photo of her, she was so darn cute then, seems so long ago now, who would have thought that my little baby girl, would have grown up to be someone so responsible and smart, I am so proud of her! 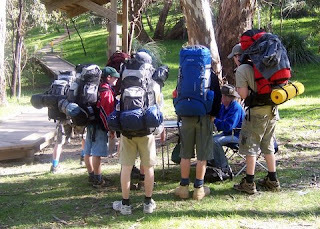 Wow love hearing about the Scout hike. my eldest not quite old enough for joeys yet but he can't wait.